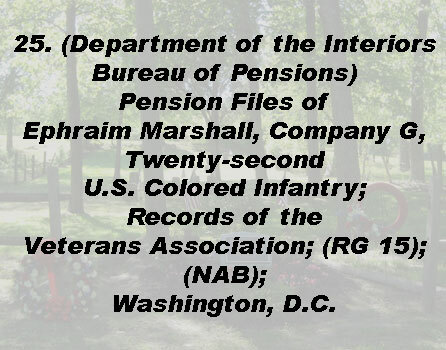 We honor you Private Lewis B. Armstrong of Co D 22nd Regiment of the United States Colored Infantry, who at age 28 enlisted in December 1863 in Philadelphia and was honorably discharged in October 1865 in Texas. Free born in Medford, NJ, around 1834, Lewis Armstrong grew up in Timbuctoo where he learned how to read and write. Lewis had several siblings. 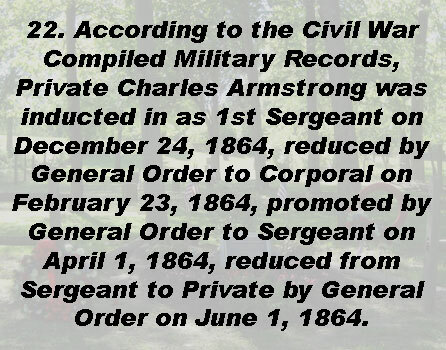 His brother Private 22 Charles B. Armstrong also enrolled in December into Co. G of the 22nd Regiment. 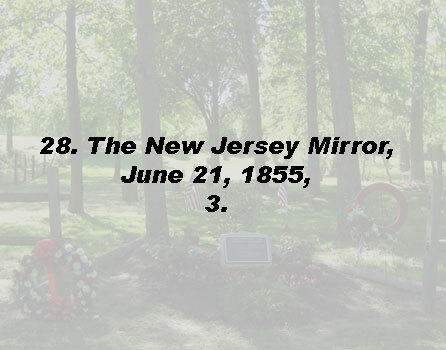 He is buried in the Fairview Cemetery in Trenton, N.J. 23 Their mother, Atta Armstrong, must have been so sad to see, seemingly her only surviving sons volunteer into the Civil War, a war that killed and maimed so many young men. Before the Civil War he was familiar with the blacksmith trade, but worked as a hod carrier hauling bricks. A hod is a long-handled, three-sided box carried over the shoulder for transporting bricks. Typically 10-12 bricks could be carried in the box per load. Depending upon the number of bricklayers serviced, a hod carrier would have lifted around 1,000 to 2,000 bricks a day. In the war he served in the infantry and worked as a blacksmith until he became too sick. It was at Gloucester Point, Virginia where, exhausted, Private Lewis Armstrong collapsed. Soldier and friend William Davis of the same company and regiment along with other comrades quickly came to his rescue and made sure that he would be placed on a boat that crossed the York River to Yorktown where he was sent to a hospital. Soon after, according to medical records, he developed pneumonia, inflammation of the lining of the lungs or pleurisy, bronchitis and then mumps. There were no antibiotics during this time and it was difficult to get better. He tried to go back into active duty, but was always too sick. It was then that the Army assigned him to the Ambulance Corps as a driver. However, this non-combatant role did not spare him from injury. Sometime during the Battle of Petersburg, he received a saber slash to his left thigh. Perhaps he was attacked on the ambulance train by a saber-wielding Confederate Cavalry soldier. This seems likely if the wagon carried greatly sought after medicine, anesthetics, and surgical instruments. 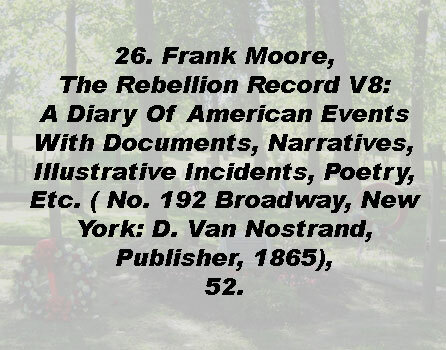 However, more likely, because he was black and if his enemy was a Confederate soldier, any humanitarian conventions that might have offered immunity to ambulance wagons would perhaps have been ignored and his attacker may have felt obliged to hurt him. Then on a mission in North Carolina he received a wound to his lower left leg, most probably from a Minie ball. 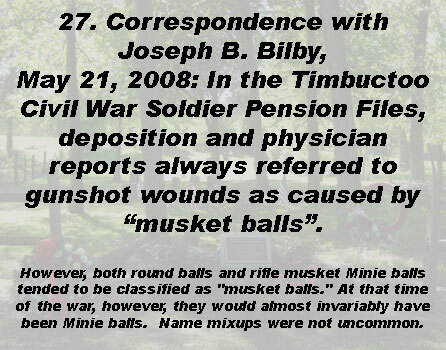 27 Minie balls would fracture and shatter bone often rendering amputation necessary. Lewis did not suffer amputation but, because of a bad union of the bone that never joined straight but at an angle, he thereafter walked with a shorter left leg and a limp. Prone to relapses because of his diseased body, he was sent to the hospital but never seemed to fully recover. When he came home, he had chronic diarrhea, a bad back, and a weakness that never let him work a heavy and productive manual job again. These disabilities did not leave him with many work options. He was forced to support his large family by cleaning rooms and by running errands for Hampton Gage’s Mount Holly grocery store. 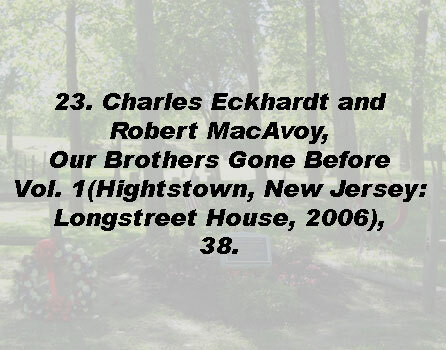 His brother, Charles, was also wounded. Because of his war injuries, his weak left hand served him no better than a useless claw. 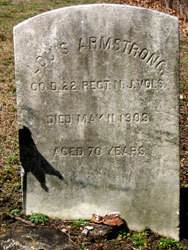 So it went for the return of the ARMSTRONG BOYS, sons of manumitted slave, Benjamin Armstrong. 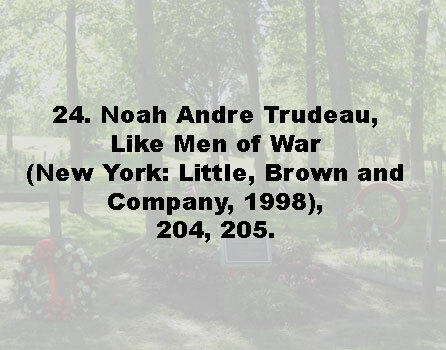 28 He had been married twice with his first marriage to Annie Christy before the war. Lewis married his second wife, Aramintie Hopkins, on July 21, 1883. They had eight children where only one survived after their father’s death. Lewis Armstrong died May 11, 1903 aged 68 years from throat cancer.